an extracellular coat, rich in glycoprotein, surrounding the oocyte; it contains microvilli of the oocyte and cellular processes of follicular cells and appears homogeneous and translucent under the light microscope. A thick transparent extracellular coat that surrounds the mammalian ovum and is composed of glycoproteins. 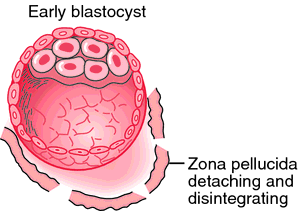 Spermatozoa bind to the zona pellucida during fertilization. the thick, transparent, noncellular membrane that encloses a mammalian ovum. It is secreted by the maturing oocyte during its development in the ovary and is retained until near the time of implantation. Also called oolemma. See also vitelline membrane. The glycoprotein-rich membrane surrounding the plasma membrane of an oocyte (egg), which binds spermatozoa and is required to initiate the acrosome reaction. An extracellular coat surrounding the oocyte; it consists of a layer of microvilli of the oocyte, cellular processes of follicular cells, and an intervening substance rich in glycoprotein; it appears homogeneous and translucent under the light microscope. a mucoprotein membrane that surrounds the egg of mammals. It is secreted by the ovarian follicle cells.